Can the company replicate its FX success in the instrument market? MPowerSynth features a tabbed interface. MeldaProduction is expanding its product line with MPowerSynth, its first plugin synthesizer. We're told that this offers "the best-sounding oscillators on the market, the most advanced distorting filters and a unique modular effects engine". This translates into more than 1500 community-designed presets, each of which has at least four macro controls that are automatically assigned to standard MIDI controllers. You can also create any number of new presets using the smart randomisation engine. Curiously, MeldaProduction says that its synth sounds "better than both analogue and digital". The oscillators are said to be free of any aliasing, distortion or other imperfections, but you also have plenty of opportunities to roughen up your sound. 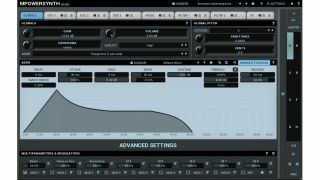 More than 100 filter types are offered, effects can be connected however you like, and you can modulate any parameter using the LFO, envelope and random generator. MPowerSynth also features a polyphonic arpeggiator with multiple creative options. Find out more on the MeldaProduction website, where you can also download a demo. MPowerSynth is currently available for the introductory price of €99/$123, and runs on PC and Mac in 32/64-bit VST/AU formats.